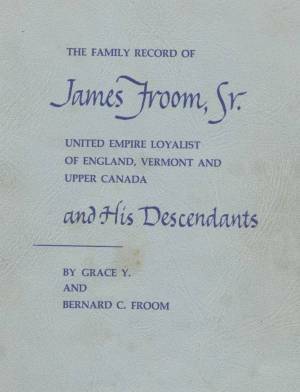 The Family Record of James Froom Sr.
Little did Grace & Bernard Froom know in January of 1970, when they began their Froom genealogical research, that they'd find so much material or that they'd discover James Froom, Sr., born in England c 1736. As Bernard said, "Wouldn't James be surprised to know we found his descendants living in six Canadian provinces, in thirteen states, and Afghanistan and England?" Grace & Bernard have since passed away, but we want to keep their book alive. This website is dedicated to their memory and their labor of love. Please don't stop when you have reached this last page but take the time to add your own family data so that your descendants may know of their heritage. See if you can find your parents, hopefully yourself. Are your records up to date? You need to be registered with us to see living descendants. If not, contact us with the pertinent information and we will update the records for you... or register with us, and you can update the records yourself. When you find yourself or a family member, click on Family to see the immediate family. Then you can click on Ancestors to see ancestors or Descendants to see descendants. You can also use this web site to discover... how that Froom you met the other day is related to you... select your name and then use the Relationships tab to enter the names of those you want to check out. Please note: We impose restrictions on access by non-registered users to personal data and media of living descendants. You or your family must already be in our data base, or you can demonstrate how you are a descendant of James Froom Sr., to register for a username and password. Once registered, you will then be able to view all the information we have for living individuals, and be allowed to update your family branch if you so desire. Registration is free and your registration data will not be divulged, given away or sold.